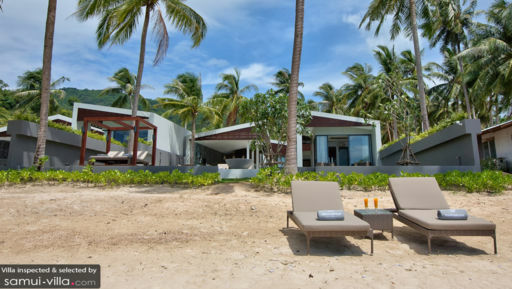 Villa Soong is a beachfront vacation complex composed of three pavilions – all highlighting innovative, geometric architecture and contemporary tropical chic. Interiors are appointed with predominantly complementary, stylishly crafted timber as well as woven wood furnishings and fixtures with a few in-vogue and lavish, as well as classic ghost pieces. Amenities are expectedly of hotel and resort standard – to guarantee sheer guest satisfaction and leisure. 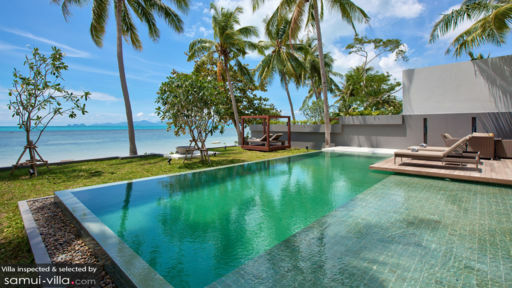 Truly, Villa Soong gives you an impressive coastal getaway with an overall feel that’s tasteful and quiet. The villa has three air-conditioned bedrooms. Two of these are in a detached pavilion, and one other bedroom is in an individual pavilion which opens out right at the edge of the swimming pool. All bedrooms have king-sized beds, as well as dedicated bathrooms with free-standing bathtubs and rain showers. The property’s exterior landscaping is beautifully balanced between a well-kept lawn and the 15-meter swimming pool. After a dip in the ocean at high tide, plunge into the swimming pool’s crystal clear, fresh water and continue your communion with your favorite element. Out of the water, you can stretch out on cushioned, woven wood pool beds on the poolside wooden deck, on the contemporized sala at the edge of the lawn, or on the beach – perfect for bonfires especially on breezy evenings. At the villa’s semi-open and breezy central pavilion is the living area. Around its long, cushioned and angled woven wood sofas facing a widescreen TV, you can all anticipate the new episode of the latest blockbuster series. Or, watch, once again, your all-time, favorite classic film. At the center of this common space is the dining area with its timber wood table that seats 8. Here, you can all relish authentic Thai cuisine – as well as your most requested comfort food – meticulously put together by the onsite chef at the fully-equipped, ultra-modern kitchen alongside the dinner table. The kitchen also has a long counter which, provided with high chairs, serves as a bar for meals, snacks, coffee and all kinds of drinks. Assigned to attend to the daily services of the villa is an efficient staff made up mostly of housekeepers. Aside from a babysitter, a laundry helper may be called in upon your request. However, their services come with a separate charge. Car and boat rentals are also available. Villa Soong is located along the quiet, white-sand beach of Laem Noi where you can go swimming ideally at high tide, or walk along its flat shoreline. From the villa, you can also go nature tripping at the Hin Lat Waterfall, at the Magic Garden or the Secret Buddha Garden and at Na Thon Bay where you will encounter the rare eight-headed coconut tree. You can also see a buffalo fight at the Bang Makham Stadium. Highly recommended restaurants in the immediate vicinity are Koh Kaew, Sunset and Krua Savoiey.